Outdoor universal Sonic Wave Solar powered mosquito zapper Insect repeller LED light is a multifunctional portable lantern with mosquitos and insects repelling function. It is suitable for indoor and outdoor use and can protect a family in various outdoor areas including home, garden, backyard, veranda, balcony from mosquitos, small bugs and insects. The lamp emits Sonic Waves that keep insects away. Brand new Outdoor universal Sonic Wave Solar powered mosquito zapper Insect repeller 8 LED light is a device powered by Solar energy and do not require electric wires and additional sources of power. However, it does provide an additional charging mode via USB plug that can supply the product with power even on rainy days. 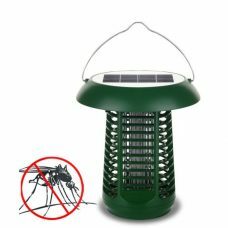 The lantern can be used as a general lighting product in addition to energy-efficient physical control over mosquitos, small bugs and insects to protector your family in both indoor and outdoor areas including a garden, backyard, patio, BBQ, pool, balcony or any other resting zone inside or outside of the home. Emitting by the LED lamp Sonic Waves creates the uncomfortable environment for insects and deters them away. As a garden solar light, the repeller has a built-in light sensor that will automatically turn the lamp on at dusk, and provide lighting during night time. 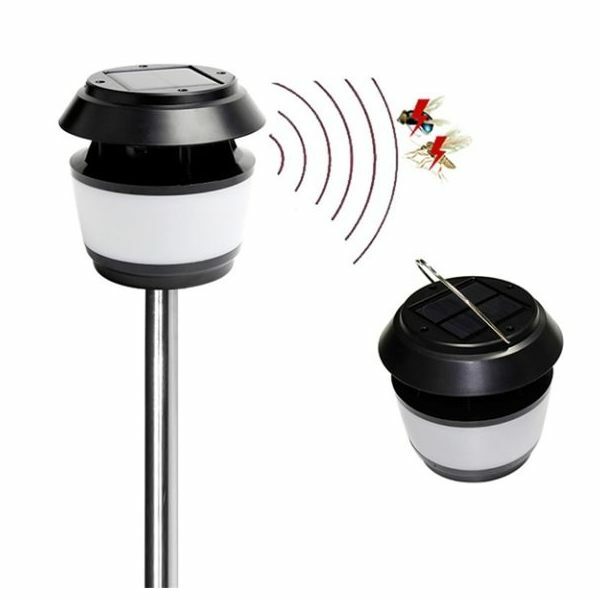 The Sonic Solar repeller is considered as one of the most efficient, cost less, and safe ways to get rid of insects and mosquitoes from outside of your home without burning or spraying any chemicals. 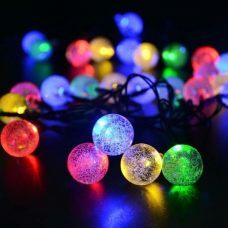 - The device has 8 LED bulbs and can be used as a fixed or portable lamp. - Waterproof and heatproof. Totally safe for people and pets. Ideal for: protecting indoor and outdoor areas like a garden, backyard, patio, veranda, pool, balcony and any other outdoor zones from mosquitos, small bugs and insects. For whom: for someone who is looking for a smart way of protecting family and loved ones against annoying mosquitos and insects without using Toxic chemical sprays and repellents. 2. Connect the Solar insect zapper head, pole sections, connecting part and ground stake together. 5. 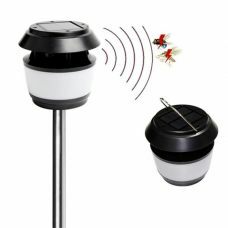 The Solar mosquito repeller is waterproof; however, do not immerse it in water. - It is recommended to place the product under the sun for recharging even it is not being used to prevent from the dead battery and maximize its life.